Family business: Sarah and Jack McCaffrey. AS SARAH MCCAFFREY palmed the ball into the Hill 16 goal to put the cherry on top of Dublin’s emphatic All-Ireland win yesterday, the cameras turned to her brother. And there were similar scenes to his fist-pumping celebrations on The Sunday Game last week. It’s fair to say that 2015 Footballer of the Year Jack McCaffrey was one of the happiest men in Croke Park as Dublin were finally having their day in the sun after three back-to-back final defeats. As she turned back towards the field, fists clenched but determined to get back to her marker for the kick out, McCaffrey gave a cheeky smile — her second goal from the bench coming as the last blow. Did she spot her brother on the screen though? “I actually saw it out of the corner of my eye, I was like ‘Don’t look up there!’” she laughs afterwards. Of course, it’s an All-Ireland double for the two Dublin football teams after the men edged Mayo in last Sunday’s thrilling final. McCaffrey was forced to an early exit however, as he sustained a dreaded cruciate injury. Regardless, it’s been a memorable week for the family, with two senior All-Ireland medals heading back home to Clontarf. “Listen, Jack had a fantastic season,” she said. “It was disappointing what happened to him, for him. And when asked if her older brother ever offers her advice, she said that he mainly leaves her to her own devices. There was no need for much advice anyway, as the 23-year-old sharpshooter struck two late goals in a remarkable 10-minute cameo. And the victory was made all the sweeter for McCaffrey, who has just recently returned from injury. Bone bruising on her foot ruled the Clontarf star out for eight weeks. She came on as a substitute in the semi-final victory over Kerry, but previous to that, her last game in the Sky Blue jersey was the Leinster final. “It hasn’t been ideal,” she continues. “But I’ve had great support from everyone involved to be able to contribute what we could, when we could. I’m very fortunate with that support system. I’m delighted with that as a personal achievement, I’m thrilled. But it’s more just like, the team…. God, wait till you see tonight! In the mixed zone after the game, Sinéad Finnegan — who was withdrawn in the first half through injury — described losing three All-Irelands in-a-row as going through a break-up every September for three consecutive years. And McCaffrey resonates: ”You could compare it to a bereavement. It really is just crushing. “Anyone who’s been on that side of it would say the same. We are very conscious of how Mayo are feeling. We’ve been there and it’s just a horrible end to what has been a terrific season for them. “All we’re thinking at the moment is how fortunate, relieved and elated we are to have gotten over the line. 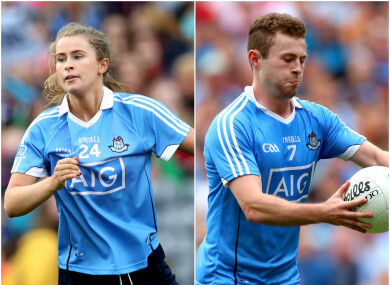 And for the first time in four years, tonight won’t be like a funeral for this Dublin team. It’s going to be one hell of a party instead. Email “On the double! Two All-Ireland medals in one week for the McCaffreys of Clontarf”. Feedback on “On the double! Two All-Ireland medals in one week for the McCaffreys of Clontarf”.